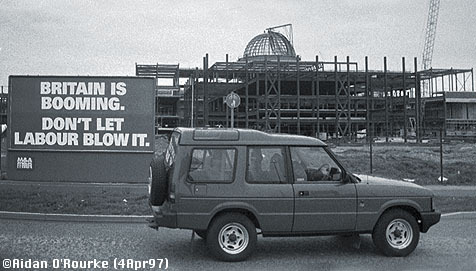 Conservative election poster next to the Trafford Centre, currently under construction. The massive shopping development at Dumplington, near Trafford Park, will be Europe's biggest. With the general election less than a month away, it's been politics, politics, politics. And one of the dominating issues of the campaign has been sleaze, sleaze, sleaze, with local MP Neil Hamilton, Conservative member for the Tatton constituency, covering Knutsford and Wilmslow, at the centre of continuing controversy. He has been accused of accepting money from the Egyptian owner of Harrod's department store, Mohammed Al-Fayed, in return for asking questions in the Houses of Parliament. Hamilton has always vociferously denied the allegation, and despite pressure from within his party to resign, and so not put under threat one of the safest Conservative seats in the country, he does not wish to do so. There was talk early in the week of the LibDems and Labour co-operating to allow an "anti-sleaze" candidate to stand against Neil Hamilton in order to unseat him. On Friday the Liberal Democrats adopted their own candidate, university physicist Roger Barlow. Today, the BBC TV war correspondent Martin Bell was chosen as the "anti-sleaze" candidate. Visit the BBC's excellent Election 1997 site for detailed election info. The post-Easter week has been quiet as regards Manchester news, though in other parts of the country, Irish terrorists have caused massive disruption, inconvenience and financial loss for hundreds of thousands of ordinary people. First there was the closure of the M1, the M5 and the M6 in the Midlands on Tuesday, due to IRA coded warnings. Two devices were found and defused. Then there was the cancellation yesterday of the Grand National at Aintree, just 30 miles west of here. The reaction has been one of universal outrage, disbelief and puzzlement: Why should the IRA target an event in which Irish sports people play so prominent a role, in a city where there are so many Irish people? Nowhere feels totally safe at the moment, not even the centre of Manchester, now changing daily as building work proceeds, or Manchester Airport, busy as usual today and full of both passengers and spectators. Let's hope the coming week's news from this part of the world is more favourable. As for the weather, winter seems to have returned with a vengeance, with heavy, cloudy skies and cold windy conditions for much of the week. Only today did things lighten up a little, before overcast, misty conditions again prevailed.